You may already know that my house has pretty much ZERO yard space. I’ve written about the trials and tribulations of a small yard, combined with living through the California drought and so it may come as no surprise that when I wanted to plant a spring garden this year, i had to do a little bit of thinking outside the box. I have shared my other vertical garden in the past, but this year I wanted to do something a little more DIY. 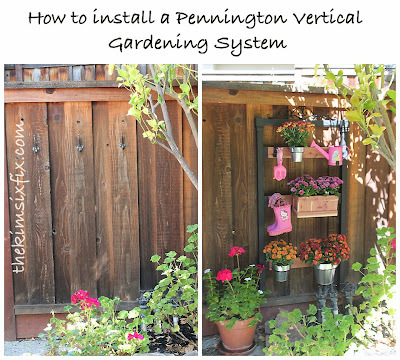 So when I was challenged by Wendi for this month’s Power Tool Challenge to do something related to patios and porches I knew this was the perfect opportunity to create my own vertical garden. I am also very lucky to be a part of this year’s Hey Let’s Grow program**, with the goal of educating home gardeners about not only the care and cultivation of their own home gardens, but also on the importance of home gardens on the environment. This program promotes things like planting pollinator friendly plants and preservation of habitats for animals like bees and butterflies. Since we live in California we get to witness the migration of the Monarch butterflies, a species at risk due to lose of habitat, decreases in milkweed plants and climate change, so this project is extra dear to my heart. To find out more about what you can do to save pollinators in your area visit the Department of Fish and Wildlife’s website. The top row was 2 types of peppers, tomatoes and basil (the making of a good Italian dish) and the bottom row is strawberries and cucumbers. I originally was going to leave them white, but decided to pretty them up a little with a few quick coats of pastel spray paint. (Hey! It’s spring!) Next I needed to secure them to the board. I scoured all the adhesives at the hardware store before finally settling on Loctite’s Power Grab Ultimate. This stuff is CRAZY strong. It is waterproof, and specifically said it would work on PVC and wood. I accidentally dropped a glob on the garage floor and my flip flop was literally STUCK. I had to use a little paint thinner to remove it. It is that strong. (I wouldn't use the other 'Power Grab all purpose’ type, it didn’t get very good reviews!) I added a pretty generous bead around the outside of the pipe (make sure to wear gloves and the instructions even recommend a mask.) I originally had plans to also secure the pipe with a few screws, but after I tried to tear them off with my full body weight, and couldn’t get them to budge, I decided the adhesive along was enough. I did make sure I got a nice thick bead and used my finger to smooth it out, which also will help keep the moisture in. (Although to prevent too much standing water in the bottom of the elbow, I did drill a drainage hole on each one.) Here you can see what they looked like when I had only filled the top row. Because they are angled up they aren’t too terrible to water. I can’t wait to see how it goes. I mean, I was SHOCKED when my topsy-turvy tomato growing experiment came out the way it did, so I am looking forward to seeing how these plants do! **I do want to say thanks to Monsanto and the HeyLet’sGrow campaign for sponsoring the supplies I used in today’s post. I was compensated for this post, but the thoughts, ideas and project were completely my own.